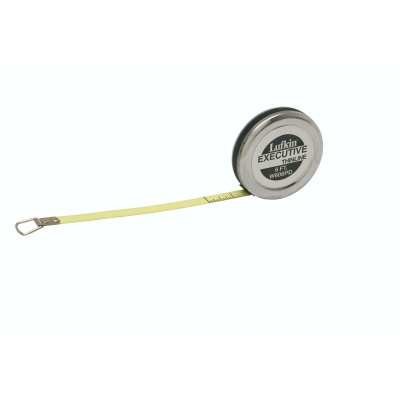 Your full-color logo will look great on this Lufkin 1/4" x 6' Executive Pipe Diameter Measuring Tape, to 100ths. Your full-color logo will look great on this Lufkin 1/4" x 6' Executive Pipe Diameter Pocket Tape, Inches. Designed for measuring diameters of pipe, cable, tire, and so on. Click to see picture of Blade style A19. This tape measures outside diameter up to 23". Polished chrome case. Zero falls in the same place on each side of the blade. For conversion from diameter to circumference, simply turn the blade. Shows diameter inches to 1/100ths. Easy-to-read bold graduations on yellow background. Spring action returns blade to case. Imprint: Digitally Printed on white vinyl panel Imprint area (approx. ): 1-1/4" diameter vinyl panel.